Netizen named Den Castillo posted on Facebook her disappointment and lamentation about the Tagaytay mishap that killed 6 teenagers. On her post, she stated what really had happened right after the accident. On January 17, Sunday, Castillo, along with 5 more of her relatives and friends, were driving back to Manila when a flaming car caught their attention. She even mentioned on her statement that they were astounded at first and thought there was a movie being filmed until they saw someone moving inside the car. According to her, the girl next to the driver was still alive and was trying to move out at that time of their arrival. What shocked them the most was that although there were bystanders in the area, no one attempted to help at once. Along with her friends and some people, they tried to rescue the victim but the fire was already big and they could no longer ease it out. Castillo also refuted Cavite police director S/Supt. Eliseo Cruz' claim that there was an 'immediate response' from the Silang Police Community Precinct with the Tagaytay rescue team and Baranggay San Jose officials who 'came first at the site'. She even debunked the alleged explosion that 'prohibited' the police officers to rescue the victims instead stated that some police officers came to the scene but left right away to 'personally report' about it. Castillo also denounced the crowd who stopped and told the nurse who tried to rescue the girl to wait for the rescue. Out of grievance,she sarcastically wished them a good sleep for causing a life who they could have saved. She also condemned the false claims of the police officials and wished them to clear out what really happened. Meanwhile, on a separate post on Facebook from the netizen named Christian Layug, he observed a relevance of the cover photos of the victims to the accident which netizens had quoted as a 'premonition'. His photo observation circulated online gathering thousands of reposts over time. However, both posts were taken down by the owners. Castillo and Layug also wished for the victims' peace. 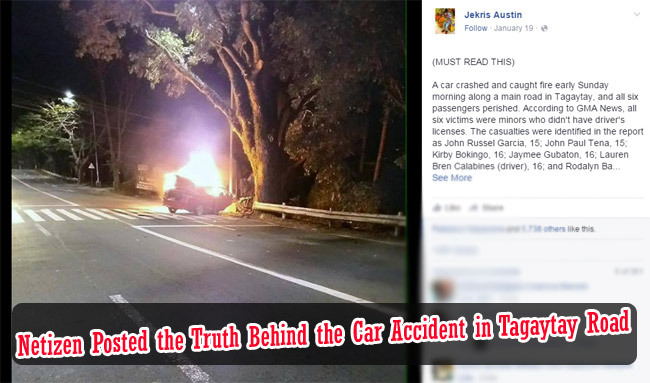 The accident happened in Tagaytay City on January 17, Sunday. Initially, Supt. Ferdinand Quirante solely identified Rodalyn Bautista, (17) because of her identification card but later on named the rest; John Russel Garcia, (15), John Paul Tena, (15), Kirby Bokingo, (16), Jaymee Gubaton, (16)and Lauren Bren Calabines (driver), (16). Based on reports, it was overspeeding that led to the crash. The victims were all minors and none of them has a driver's license. 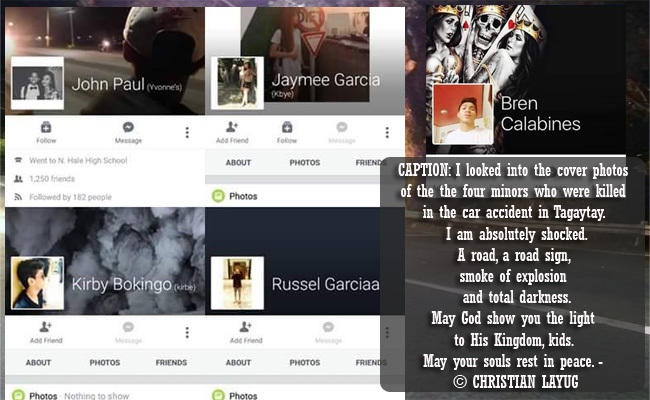 CAPTION: I looked into the cover photos of the the four minors who were killed in the car accident in Tagaytay. I am absolutely shocked. A road, a road sign, smoke of explosion and total darkness.